We’re nine people, trekking through Portola Redwoods State Park on a sunny Saturday afternoon. It feels like the best time and place to be outside; under the redwoods, the air is crisp and cool. All of us are in good spirits. We are led by Rolando Cohen, Chief Operating Officer and Chief Financial Officer, and Harry Pollack, General Counsel, for Save the Redwoods League. We’ve lucked out since both know a lot about the redwoods and are eager to share their enthusiasm with the group. Along the trail, we frequently stop to marvel at mushrooms, fairy rings, whorled redwood bark and goosepens—all the strange, wonderful features of the redwood forest. Our hike was a component of the League’s Free Redwoods Days, which will happen every second Saturday of this year. Across the state, dozens of redwoods state parks are offering free day-use passes, which you can get on our website, in celebration of the League’s centennial. A few members of our group, including myself, had never been to Portola Redwoods, which turned out to be a vastly underrated gem of a forest. 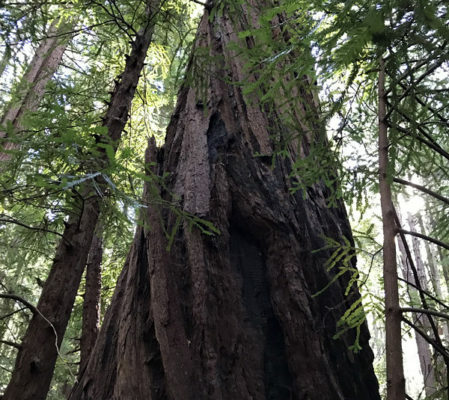 We began by visiting the Old Tree, an especially massive old-growth coast redwood, which is located about half a mile from the visitors center. Its sprawling, gnarled base is so wide—even our combined arm spans probably couldn’t wrap around its circumference. After stopping to admire Old Tree, we circled back and ascended Slate Creek Trail, which winds up a hill, to more arid sections of the forest. An hour in and we had only crossed paths with a lone hiker and a couple of backpackers. Other times, it was just us. “It’s remarkable how few people come out this way,” Harry comments. Soon into our hike, sounds of the forest yielded to a steady stream of conversation. Any ice, the initial shyness between strangers, quickly melted away. Our group ran the gamut of topics, from hiking and international travel, to family and work. We had come from all over the Bay: one couple from Fremont; two friends from San Mateo. I, and a father and son, drove up from Santa Cruz. After hiking for about an hour, we reached Page Mill Site, our final destination. Over a century ago, in 1867, William Page opened a shingle mill along Peters Creek. Shakes and shingles, made of brittle, rot-resistant redwood, were shipped to the Bay via Page Mill Road, which still exists today. Below the trail, Peters Creek splits into two slow-moving streams, which twist around a bank covered with redwood sorrel. The entire landscape is unbelievably verdant, very easy on the eyes. Standing under magnificent, old-growth redwood trees, I can’t help but full-heartedly agree. Want to walk among these giant redwood trees? The League is sponsoring one free day each month at more than 40 of California’s redwood state parks in 2018. Learn how you can get a pass for the Free Redwoods Days and plan your trip on ExploreRedwoods.org. Can You Play Forest ‘Match’-Maker? In honor of Valentine’s Day, we’re thinking about the iconic redwood forest duos—those essential relationships between the trees, the environment, and the creatures who make the redwood forests their home. Can you guess any of these amazing duos?